IN THE NOT-SO-DISTANT future, your personal tech will behave like the sun. It will rise and shine brightly in the morning, and set and dim its lights as the day winds down. In a recent preview for iOS 9.3, Apple teased a new feature called Night Shift that does exactly this, automatically altering the color of your screen display to make it orange-colored in the evening. 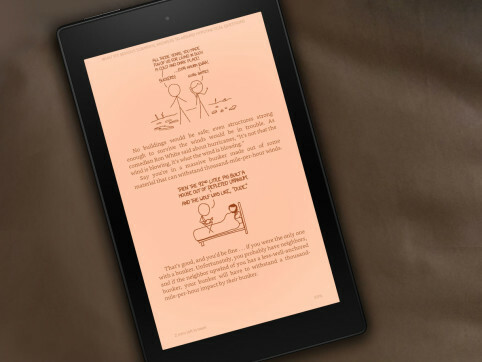 Last month, Amazon released a similar feature, called Blue Shade, in an OS update for its Fire reading tablets. The new feature lets nighttime users dim the amount of blue light that comes off the Fire’s screen, in favor of a mellow, amber glow. Apple’s feature technically doesn’t exist yet, but the point of it, and Blue Shade, is simple: to let us get some sleep. The underlying tech—blue light that fades into orange light as the day wanes—is a direct response to a large and growing body of evidence that suggests late-night exposure to artificial light can disrupt your body’s circadian rhythms, light-triggered physiological changes that regulate bodily functions ranging from sleep to metabolism. This light-shifting technology, while novel to Apple and Amazon, isn’t new. As the 15 million people who’ve downloaded f.lux can tell you, software that turns your computer screen orange has been available for years—seven, to be exact. But it’s only now that this bit of UX seems poised to go mainstream. F.lux was founded almost by accident. In 2008 Michael and Lorna Herf had recently left their jobs working on Google’s photo management tool Picasa, and were living in Santa Monica. Lorna is a painter and used the upstairs loft in their apartment for her studio, where she would often work through the night. She quickly ran into a problem: Even with lamps and lightbulbs, the lack of sunlight obfuscated the hues of her paints, messing up the outcome of her work. “All the colors came out completely wrong, and this thing she thought to be, say, orange would be bright pink,” Herf says of his wife’s dilemma. For ages, parents everywhere have warned their kids about the ills of sitting too close to the television screen; today, that concern has been recast into a worry that staring for hours on end at our laptops, tablets, and phones can’t be all that good for our health. Science backs this up: Studies have shown that exposure to certain wavelengths of blue light can suppress melatonin production in humans. Melatonin is a hormone that helps induce sleep, and it “is a robust marker of circadian rhythmicity,” says Richard Stevens, a cancer epidemiologist at the University of Connecticut Health Center who has studied the physiological effects of light exposure for more than two decades. In other words: more screen time equals less sleep time. Amazon’s newly introduced Blue Shade is a peachy backdrop that’s reminiscent of the Financial Times’s salmon pink paper color.